I’ve been meditating for years, but the MNDFL studio, which resembles some blissed-out gazillionare’s Tribeca loft, is like nothing I’ve experienced. There are no long lectures or exotic shrines. Here, the stripped-down sessions, which cost $10 to $25, last 45 minutes tops, like a Soul Cycle class. Folks who book a class online can select a specific cushion in advance, the way you would select a window seat when booking a flight. And one can sample just about any type of meditation. MNDFL teachers specialize in nearly a dozen different traditions ranging from Zen to Jewish practices and mantra-based Vedic methods. “It’s like a meditation mall,” I said. Co-founder and Chief Executive Officer Ellie Burrows, who oversees the studio’s “user experience,” said she approached Mr. Rinzler with the idea because she found other venues wanting. “I said, ‘How come there’s no place I can meditate in New York that’s like a nail salon, or a Body by Simone?’” she recalled. “The fact that you had to go to a religious center was a barrier to entry,” she added. The business might not have been possible five years ago. Only recently have scientific studies convinced the finance and tech crowds that the benefits of meditation—increased focus and productivity—are worth their time and money. “They’re investing in themselves, and then they literally see an ROI on themselves,” said Ms. Burrows. Still, if you’re old-school like me, the notion of a meditation business feels unsettling. Most centers around town, after all, are nonprofit; many offer free classes. His view is echoed by Dina Kaplan, founder of local meditation startup the Path. At a recent Path session at a Chelsea gallery, there was plenty of toilet paper on hand. The space, decked out with shimmering candles and soft jazz, felt like a high-end cocktail lounge. Instructor Pandit Dasa took the class through a series of breathing exercises and mantras. I didn’t attain enlightenment, but ended feeling relaxed, like I’d gotten a good massage. I chatted with Mr. Dasa afterward. He spent 15 years—until last December—living as a Hindu monk at an East Village monastery, wearing saffron robes. His reasons for leaving were personal, he said. But there is an unexpected side benefit: Companies feel much more comfortable now hiring him to conduct workshops. There was no mention of his strong Hindu faith. These days, he introduces workshops with research from Harvard and MIT. Mr. Dasa, who worked as a mortgage broker before entering the monkhood, said that while some may jump on the meditation bandwagon to cash in, that’s not him. After all, he’s meditated for decades. It was his good fortune to leave the monkhood at a time when folks are willing to pay for his teachings. “I’d rather earn a living healing people with the knowledge I’ve gained over the past years than doing a desk job for some corporation,” said Mr. Dasa. Behind every lawmaker on Capitol Hill are dozens of young, ambitious staff members. Frequently pale from exhaustion, they work frenetically, touting the demanding work culture like a badge of honor. Despite the sense of glory they ascribe to this exhausting pace, there is at least one place where staffers aren't judged for taking a moment to breathe. 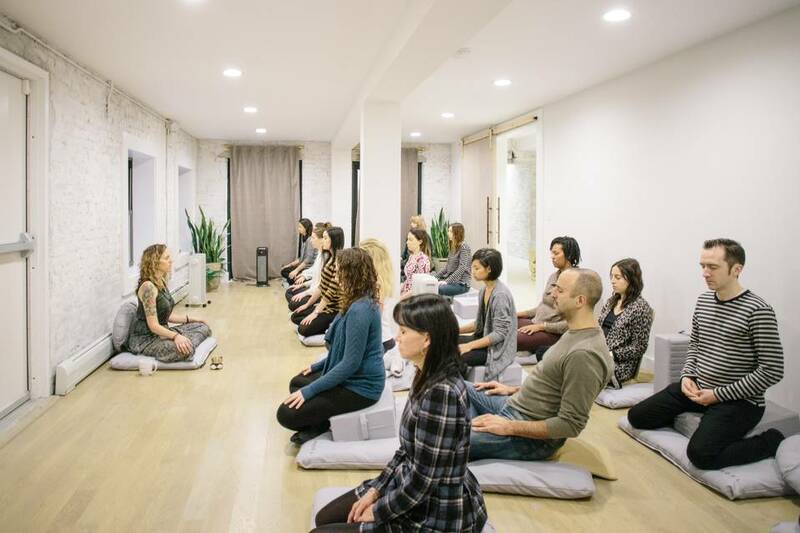 Once a week or so, 25 to 50 staff members come together, not for happy hours or Crossfit sessions, but to practice the more reflective art of meditation. This group is casually referred to as the "Quiet Time Caucus." They gather in a ratty-looking meeting room in one of the Capitol's office buildings. On a recent Tuesday afternoon, Stephanie Sheridan, a local yoga instructor, was leading the meditation. "Try and sit up tall, so you can shrug your shoulders up towards your ears, as you inhale," she says, breathing in. "And then exhale. Go ahead and release the shoulders back down." Rather than tell colleagues where they're headed each week, many in this group keep their meditation practice secret. "The fear is that you're going to be judged as weird," says Denise Fleming, a senior legislative assistant. "Or the worst stigma on Capitol Hill is for people to think you're not working. And so a lot of us here try to avoid that and we just don't tell anyone." Being a congressional staffer is young people's work, says Fleming, who describes herself as "older," even though she's just 27. The work is "soul-sucking," she says, so she started looking for new ways to bring down her stress. Around the same time, she heard about the meditation group in a "Dear Colleague" email. "I think now people would describe me as centered and calm," she says. Today, for instance, Fleming has a very long to-do list to finish before 6 p.m. But during the 30-minute meditation, all that slips away. "I can go back to work calm and refreshed," she says. "I feel like I'll make better decisions." Rep. Tim Ryan, D-Ohio, started the Quiet Time Caucus about three years ago. He participates in the staff group and runs another for senators and congressmen. I talked to him in the House Chapel, where legislative members meet. Unlike the staff meeting room, it has an ornate ceiling and stained glass window with George Washington kneeling in the center. Ryan, a former athlete, told me how corporations and sports teams now use mindfulness practices to get better results from players and workers. "It's the ultimate prevention," he said, because it can stop people from "doing or saying something stupid." This, of course, seems particularly vital when weighing decisions of national importance. Ryan's meditation groups are hardly a side project. He believes the federal government should be integrating mindfulness into all of its policies, from veterans affairs to health care to education. "Why wouldn't we have an education policy, for example, that would teach kids to regulate their emotional state?" asks Ryan. "Because I know that if you can't do that, we're gonna be paying for you big time down the road." Ryan hopes to gain an ally in new Speaker of the House Paul Ryan, R-Wis., who does yoga and works out for more than an hour each morning. 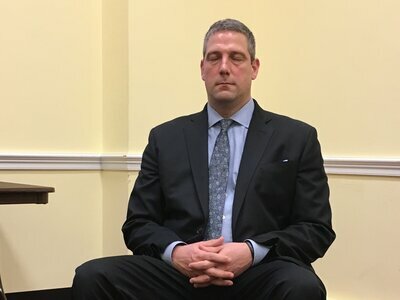 But for the meantime, Tim Ryan's mindfulness policies are having a more microeffect. 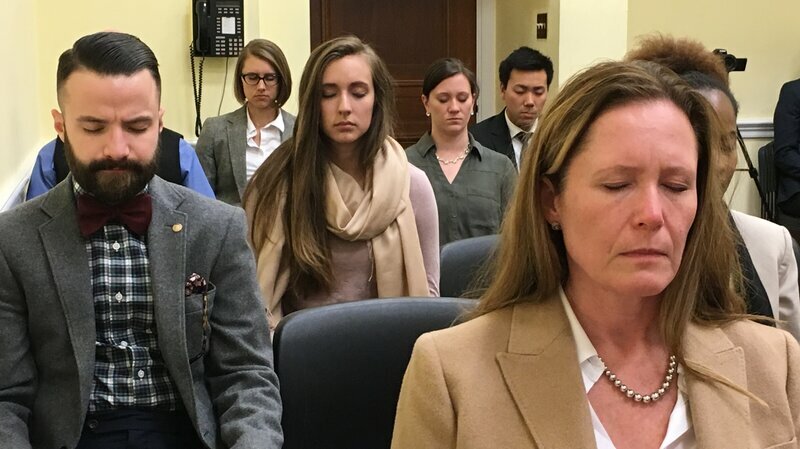 Denise Fleming, the legislative assistant, says meditation and mindfulness have given her a kind of personal insulation from the battle-like conditions of Capitol Hill. I couldn't help but think she'd discovered some kind of secret. Often she sees people shouting back and forth at each other, trying to push their ideas or agenda to victory. She approaches these fights differently. "Many times I've said to my boss or coworkers, 'let's pause and think about this,'" she says. "And that pause has saved a lot of heartbreak or frustration."